Included in this one book and CD combo are almost 500 easy-to-implement tools, forms, checklists, posters, templates and training aids to help you get your operation more organized, manageable and profitable! The material may be used as is or readily adapted for any food service application. Specifically designed for foodservice, the CD contains PDF files that you can open and print with PCs or Macs. For new and veteran food service operators alike, this book and CD combo is a unique "survival kit" packed with tested advice, practical guidelines and ready-to-use materials for all aspects of your job. The book and companion CD-ROM focuses on the issues, situations and tasks that you face daily in your management role as leader, manager, arbitrator, evaluator, chairperson, disciplinarian and more; from working with difficult customers and employees to ensuring the profitability of your operation. Specifically designed for foodservice, the CD contains PDF files that you simply open and print. Included in this book are hundreds of easy-to-implement tools, forms, checklists, posters, templates and training aids to help you get your operation better organized, easier to manage and more profitable! 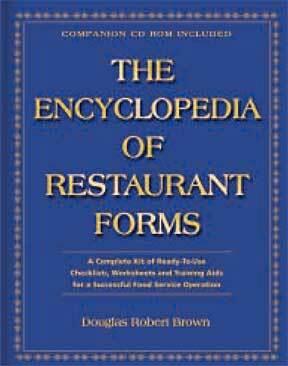 The material may be used as is or readily adapted for any food service application. Management of equipment and money. This manual will arm you with the right information to help you do your job. Keep it on your desk for continual reference. The many valuable forms contained in this work may be easily printed out and customized from the companion CD-ROM. There are over 488 ready-to-use business forms, checklists, training aids, contracts and agreements!